‘An aromatic of Paradise.’ Mm doesn’t that sound wonderful? That’s how ginger is described in the Koran. Strangely enough though, in spite of such lavish praise, ginger plays only a small part in Middle Eastern cooking; it’s in the cookery of the Asia that it comes to the forefront. But maybe that’s not so surprising as ginger is a native of south-eastern Asia. As well as the Koran, it’s mentioned in ancient writings from China and India, where its culinary and medicinal properties are highly prized. Its original Sanskrit name meant ‘horn root’, a reflection of its appearance; the word ginger comes from the Middle English word, gingivere. 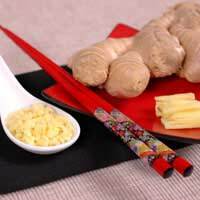 First imported at great expense by the Romans from China two thousand years ago, ginger became popular around the Mediterranean countries. Spanish explorers took it with them on their travels across the Atlantic and today Jamaica is one of the top producers and exporters of ginger. Ginger has always been an important spice not only for cooking but for medicinal purposes. In Asian medicine it’s been used as a treatment for many ailments including colds and shortness of breath. While these claims haven’t been tested fully yet it has been scientifically proven that ginger is very effective as a remedy for motion sickness and upset stomachs. Grate a teaspoonful of root ginger and place it in a cup. Add boiling water and leave to steep for a few minutes. Sip the tea before taking a trip or if you feel nauseous. For athlete’s foot, make a large pot of ginger tea (as above), cool and use to soak your feet. It has anti-fungal properties that will ease the irritation. Fresh ginger is an ingredient in very many Chinese dishes. For stir-fries the ginger is grated finely, cooked briefly, and the flavour is spicy and fresh. Thai cookery uses ginger to flavour many of its coconut milk-based curries, using it to make a paste with other spices. In India and Sri Lanka, you’ll most often find ginger fried, maybe with garlic, to give a rich but milder flavour. This method is especially popular in Northern India cookery. Ginger tea is enjoyed as a warming drink in the Himalayas. Should You Use Ginger Fresh Or Dry? Both the fresh and dried forms are available in the UK. The dried spice is mostly used for baking purposes e.g. for ginger biscuits or gingerbread. (Incidentally it’s said that Elizabeth I was responsible for the invention of the gingerbread man.) The taste of the dried spice is very different from that of freshly grated root ginger, which is altogether fresher and more lemony.Although it’s known commonly as root ginger, what we buy in the shops isn’t actually the root of the plant, even though it grows and spreads underground. Botanically speaking the knobbly-shaped object we buy is a rhizome. When buying root ginger, choose a firm, smooth-skinned rhizome. If it’s got any sign of mould, leave it in the shop. To use it, you must first peel the root ginger with a parer, removing all the tough outer skin. Then grate or slice as required by your recipe. You’ll find that the flavour the dish will acquire from the root ginger will depend on when it’s added. The longer it’s cooked, the greater its pungency.